Today’s environment of almost unlimited audio choices means advertisers and stations must craft targeted messages and personalized outreach to listeners. The more we understand consumers, the better we are able to speak to them, which brings importance to the understanding of ethnic listeners and their digital media habits. Edison Research’s The Infinite Dial, the longest-running study of digital media and technology behavior in the U.S., is done in partnership with Triton Digital, and allows us to take a look at the media habits of African American and Hispanic consumers, and understand how their usage may differ from that of the total population. The majority of Hispanics (77%) and African Americans (76%), like the total population of the U.S. (79%), are currently using social media of some sort. Facebook and Instagram garner the most familiarity with both groups but the biggest difference is with WhatsApp. One-third of Hispanics say they use WhatsApp compared to 19% of African Americans and 18% of the total population. There are some differences with social media used most often, too: Fifty-one percent of African Americans say they use Facebook most often but only 39% of Hispanics say the same. We have seen through previous studies that Facebook usage is on the decline among those in younger demos, so we will be watching to see how this bears out in future studies among all ethnicities. Smartphones are prevalent across every ethnic group, with over 80% ownership among Hispanics and 85% among African Americans. Smart speakers just made an entrance onto the audio scene about four years ago and the awareness of smart speakers is now at 75% among African Americans and 62% among Hispanics. The voice-enabled technology of the smart speaker is being embraced as one in five Hispanic Americans owns a smart speaker. The number is only slightly smaller, 18%, for African Americans. In what area of The Infinite Dial do we see reach numbers for total population, African American, and Hispanic listeners being almost identical? Online audio listening. Sixty-seven percent of the total population has listened to online audio in the past month, identical to 67% of African Americans and compared to 66% of Hispanics. This Internet-delivered audio includes streams from AM/FM radio stations, pureplays such as Pandora and Spotify, streams from Sirius/XM, podcasts, and music on YouTube. And when it comes to time spent listening per week, African American listeners, in particular, spend more time listening than average. We have seen the overall time spent listening to internet-delivered audio increase over the past few years so it is no surprise that listeners of all ethnicities are exploring these expanding audio choices. There are varying levels of awareness and usage of each online audio brand and those can be found in the full report, but at a summary level, Pandora and iHeartRadio have the largest awareness among African Americans while Pandora and Apple Music (with Amazon a close third) have the highest awareness among Hispanics. As far as actual usage in the past month, Pandora and Spotify are the top two audio brands for all ethnicities. African Americans are significantly more likely than Hispanics or the total population to be aware of and use SoundCloud. As new players continue to gain traction, we see YouTube Music making strides with African American and Hispanic listeners. Over half of African Americans and Hispanics have used the service in the last week. 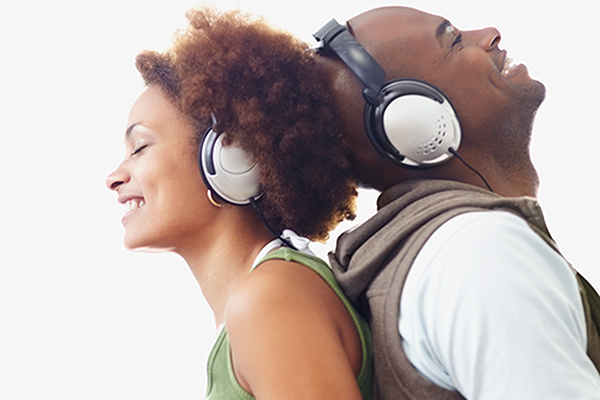 African American and Hispanic listeners still reach for the traditional AM/FM radio when they are in the car, with 71% of African American listeners and 73% of Hispanic listeners currently using radio in the car. Almost half of each group, 48%, say that radio is the audio source they use most often in-car, so radio remains an excellent reach vehicle for in-car listeners. Aux cords and earbuds are making listening through smartphones in-car a reality, and almost half of African Americans, 49%, say they have listened to online audio through a cell phone while they are in the car, indexing above the total population of 41%. When it comes to podcasting, a burgeoning audio choice for many people, over half of African Americans have ever listened to a podcast, 51%, which is the same as that of the total population. Now that podcasting has hit the tipping point of having reached over half of Americans, we can expect that advertisers and media outlets will take this platform into account as they try to reach consumers and disseminate their messages. Hispanic listeners track behind that number at 36% for having ever listened to a podcast. Although some of that difference for Hispanics could be due to less availability of Spanish-language podcasts, the data suggests that Hispanic consumers are less familiar with podcasting in general than African Americans or the total population. Your takeaway from the few minutes you have spent with this blog post should be this: African American and Hispanic consumers can be reached through social media, online audio, traditional radio, and smart speakers, and in the spaces where these platforms and programming overlap. Consider the places on the “infinite dial” of digital media where you are best served to find them. But most importantly, AM/FM radio continues to play an important role and position in the lives of these consumer segments. The full data set of African American and Hispanic consumers as well as the total U.S. population report can be found within the research studies section of Why Radio. The Infinite Dial 2019 for African Americans and Hispanics is available here for download. What is your experience in the role that AM/FM radio plays when targeting the African American and Hispanic populations? Note: Data for African American and Hispanic persons 12+ was derived from The Infinite Dial 2019 survey, done in partnership with Triton Digital. Data was collected through a telephone survey offered in both Spanish and English.